Guest review today from J.A. Warnock our voice from the Borders. 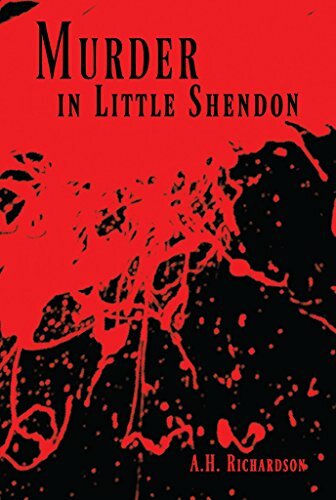 Murder in Little Shendon was published in 2015 by Serano Press. It is available on Amazon in paperback and Kindle format. I am going to review ‘Murder in Little Shendon’ by A. H. Richardson from front to back. Don’t judge me; it is as good an idea as any other! The front cover is an interesting design which hovers somewhere between the murder scene blood spatter and a Rorschach test. The smiling faced, friendly looking ghostly shape (centre left) is oddly comforting though possibly the imaginings of my deranged brain. Opening the cover, the warm, fuzzy feeling continues with a delightfully quaint list of contents. I cannot recall the last time I was presented with so reassuring a chapter heading as “And the murderer is…” and scanning down the rest of the list there is a definite theme of anyone for tennis and pink gin on the lawn. It is hard to know at this point if the author is aiming for a satirical swipe a la Comic Strip’s Famous Five or a faithful homage to English Murder Mystery writing but either way it is an enticing beginning; I willingly turn to page three. Two things immediately become clear. First is that the book is intended in earnest. Second is that I cannot review page by page or we will be here all week! As is the prerogative of all good old-fashioned whodunits, the police are entirely unable (or in this case unwilling) to solve a serious crime without the assistance of an amateur sleuth or two and a title, posh accent or having done something meaningful in the war is all the qualification one needs to start taking statements. If this all sounds painfully twee then this book is absolutely not for you and you should stop reading now. If, on the other hand, this sounds like exactly your cup of tea then I can assure you ‘Murder in Little Shendon’ is a nice example of its kind and you should definitely give it a go. The story unfolds slowly with each detective interviewing a seemingly inexhaustible list of possible suspects and then reporting back to the group giving the reader every opportunity to analyse the evidence and draw their own conclusions. This is a fantastic book for anyone who likes to play along and try to work out which clues are clues and which are red herrings. The village contains the most eclectic mix of characters. In fact the only factor that unites them, other than their postcode, is their universal dislike of the murder victim. Richardson cleverly adds a secondary layer of confusion when villagers start suspecting other villagers and with a variety of well meaning attempts to divert the glare of suspicion. All in all the plot is as tangled as a ball of Miss Marple’s knitting wool. I highly recommend getting your own copy and having a go at untangling it for yourself. Four Stars.